That a short, twill skirt and stilettos would become my nemesis in Taiwan, who would have thought that? I certainly did not. Skirts, I surmised, were perfect for a festival. But amidst the cracker of a festival in the squat town of Yang Shui, the gods think otherwise. The gods, however, are not the ruse for the “all-covered” diktat; when a thousand rockets fly all around the town, skirts, skorts and all things short can turn one into highly inflammable. For this is no ordinary festival, I was in Taiwan for the Beehive Rockets Festival, which, well, is all about fuming rockets that are not shot into the sky but at the revellers. Warning: Before you partake in the festivities, there’s the helmet, jacket, knee-length boots, gloves and face mask waiting. And yes, a thousand rockets. Perhaps a million. “Buckle the helmet tight.” I first heard the admonition. A pile of sturdy helmets were stacked languidly on a wooden table on Yang Shui’s main street that was getting scrubbed, decked, spruced, festooned for the annual festival. I looked at the black sparkly helmet and the frayed grey jacket and winced. Gawd! I would look preposterous in the helmet and drab jacket. Do I have to walk in these? Could I get a white? A red, perhaps? “Do not be picky about colours, this is no biker-chic. Soon, there would be rockets everywhere. And stop fussing about looking dowdy,” Claire Hsu of Taiwan Tourism chided. I looked around and found comfort in an entire town’s frumpiness – everyone was bundled in protection gear. Imagine an entire town cluttered with helmet-wearing merrymakers! Everyone, everything seemed battle ready – wooden scaffoldings stacked with firecrackers at every crossroad, deities on palanquins garlanded with gig lamps, petite girls hawking skewered squids and fried octopus, men walking the streets like marauding soldiers, and the air burdened with the whiff of combustible crackers. Far away, in the temple stood Guan Holy Sovereign, the Chinese War God, whose story goes back 100 years to the dreaded decade when the most important port town of Qing Dynasty was ravaged by a cholera affliction. The harried villagers invoked the Guan who suggested an entire night of fireworks as a cholera antidote. And lo! Overnight cholera was wiped out and the town kept alive the all-night firecrackers festival that is celebrated on the 15 th day of the Chinese Lunar Year. The rockets were ready to roar and before I could beseech the Guan to save me from the firecrackers, a rocket ricocheted off the scaffolding (in festive epiphany it is called ‘castle’) and whizzed past. I ducked for safety but an ember fell on my shoulder. From behind the smoked visor, I saw a tiny spark and sniffed the burnt hole on my jacket. My wail was drowned in the din of the buzzing rockets and screaming revellers; in the haze of the burning firecrackers, I had lost Hsu. I could run nowhere, smoke had swallowed all of Yang Shui. There stood I. Like a startled, battle weary soldier, gasping for that one last breath. As the firecrackers died, a hush fell, and my heart quivered. In Yang Shui, I was alive. With a burnt jacket, a bruised hand and the glee that would last a lifetime! That, however, was not the last I played with fire in Taiwan . There was the Lantern Festival that is celebrated all over Taiwan . I was headed to Miaoli, the venue of the Official Lantern Festival which is organised by the Taiwan Tourism Board. This Chinese new year is special – not only is it the Year of the Rabbit, but it also marks 100 years of the Republic of China that was founded after the 1911 Chinese Revolution. 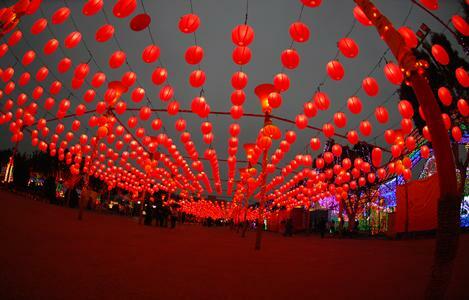 In the Zhunan Sports Park , the main gate was adorned with the traditional paper lanterns. Inside the park, the lanterns had acquired varied shapes and colours – colossal peacock, giant strawberry, a mansion, a tea ceremony, a svelte dancer, an agile performer… lanterns crafted by school/college students that looked more like art masterpieces. In my hand was a tiny paper rabbit lantern that I had painstakingly assembled from a lantern-making kit. A miniature LED bulb flickered on the rabbit’s back – I ushered the new year with a prayer and the paper rabbit with a twisted tail. Two days in Tainan County I had played with too much fire, but I could not have stepped out of the historic region without digging into the Tan Tsai noodles in Tu Hsiao Yueh, Taiwan ’s oldest and most famous noodle shop. Established by Yu Tou in 1895 to feed the typhoon-hit fishermen, the tiny restaurant is a rage with gourmands, specially its minced pork which is simmered in an ancient wok for nearly nine hours! Being a vegetarian has its own woes, so I settled for plum juice, fried tofu, fairy grass broth. Later, in a Hakka village, I pigged on dried plums and corn jerky, dipped cookies in India Tea in Narrow Door Café (the entrance to the café is just 40 cms. wide!) and said a prayer at the first temple dedicated to Confucius. Back in Taipei , I hopped across the Feng Sui fountain and the red Love sign to the world’s tallest built skyscraper. I could have huffed 2,046 steps up the Taipei 101, instead I took the world’s fastest elevator. Whoosh! In one minute it does 1,010 metres! If I took that elevator to Mt Everest, I could have hoisted the tricolour on the peak in eight minutes flat. But in 39 seconds I reached the 88 th floor observatory from where not only could I see the city sprawled in the Taipei Basin, I could even send a quick email to the angels - for Taipei has the highest wireless penetration in the world. I was so close to the clouds but where were the angels? Lazy on a rainy day? I missed seeing them but in the haze below I could identify the black roof of Dr Sun Yat Sen Memorial, the Father of the Nation. On the 88 th floor, more colours fell my way – natural corals in burnished orange and emerald green stringed as pendants and crafted as dainty rosettes, stalactites perched on veneered oak frames and pebbles embellished with hand-painted squiggles. In Taiwan , corals and jade are everywhere. Almost everywhere. In Taipei, I had assiduously lined up the foodie’s to-do list that included the imperial banquet at Silks Palace, Din Tai Fung, the xiaolongbao (steamed dim sum) restaurant that was rated by The New York Times among the top 10 restaurants in the world and – hold your breath – the Modern Toilet, a restaurant where lights are shaped like poop, curry is served on toilet-shaped plates, drinks come in plastic urinals, painted WC lids hang on the walls, a bath tub serves as a table and sorry, no chairs. Everyone sits on stylish acrylic pots. Yes, with the lid down. Not to forget the night markets where food can be as bizarre as your palate can afford to. In the Sanke Alley, you can mix rice wine with snake blood and quaff the favourite aphrodisiac; in Shi Lin market, oyster omelettes and squid stew are a rage; in Shida, get the don hua (dessert that looks like tofu and served with peanuts) and Taiwanese sausage. There’s stinky tofu, wasabi peas, suncakes with a heart of molasses, coffin bread filled with pepper beef or curried chicken, bubble tea. So many snacks. So many delicacies! What I would never forget is the rice cake that a really old woman gifted me on the night of Valentine’s Day. I was in Shop no. 25 in Shi Lin market adding sesame paste into fried hakka noodles. In another corner, sat a frail woman, cragged with age and penury, gingerly picking sticky rice with chopsticks. She spoke no English, I no Mandarin. It was Valentine’s Day and in the spirit of the day, I offered to pay for the meal of the woman whose name I knew not. The restaurant owner acted as the interpreter. Startled at the generosity, the old woman walked up to me, a tear hurrying down her cheeks. She hugged me and pulled out a rice cake from her tattered bag and mumbled a xia xia (thank you in Mandarin). The moment’s sanctity befuddled me, I stood in absolute silence. I am back from Taipei . I have forgotten the rocket bruise. All I remember is that moment in Shi Lin market’s Shop No. 25 and the old woman whose name I know not.